30 min Run: Didn't go as planned. Feet are inflamed and uncomfortable. I walked 9/10ths of 2.25 miles limping straight to the car. Pretty upset. I wanted to be flowing by now. As I drive off all my mind was talking about was chips. I resisted Micky D's and the others, but now I'm sitting outside the Jamaican restaurant trying to convince myself I won't eat that much of the carb / fat laden meal. Lol, I'm supposed to be a lean, low carb kind of girl looool! Emotional eating is a hot, irrational mess. This is what I eneded up with. Lower carb, but I'm sure a week's work of fat. At least it tasted really good. Rest Day: And I did just that. Starting to understand why they are so important. My legs are heavy and stiff. 20 min Run: Since trying to make a comeback from my extended vacation and being sick for two months my focus for running, has been way off even though my legs and breathing seem pretty good. I had been thinking about using the C25K app again, but was feeling kind of embarrassed because I used to be able to run 8 miles naked (without GPS & music) many times a week. I was very proud of that and now here I am starting over. Wow! But I got over myself and used the app today. The run went really well and I was pleased. I went back to the Jamaican restaurant and got the same dish but no rice. I replaced the rice with mixed vegetables. 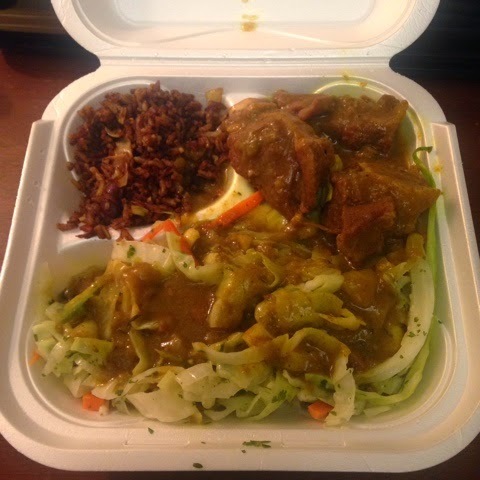 Cabbage, mixed veg and curry goat. It was amazing. Eat when you are up and eat when you are down and everything in between. Untamed emotional eating is a beast. At this rate I guess I'm not trying to lose weight. Clearly I'm exercising for my the sake of my lungs considering my diet is all over the place. I'm so hungry after a workout and eat too much that it is scary. If I'm not careful I will have gained weight by the end of this training. 70 min Ride: I'm excited to let you know that I now have an excellent Cycle Coach. Nedra Deadwyler, Owner of Civil Bikes came on board to help me out. I met her at the office. Today was my first lesson and what a world of difference it made. I knew I needed help but I was also a bit skeptical. I grew up riding a bike. Do I really need a lesson? How difficult could it really be? Well, the difference turned out to be night and day. The main reason for wanting a cycle coach was to solve some of the issues I was having with gear changing and seat pain. After only about 15 mins into the session the Lady bits business was settled for good. My tires require 50 - 75 pounds per square inch of air. I had less than 20. Duh! Even though the tires were firm to the touch they just weren't firm enough. That, coupled with a minor seat and handlebar adjustment and I was set. Before, from the very moment I sat on the bike I would begin experiencing pain. By the end of 15 minutes I was wincing. Now I can ride the bike for an hour and not feel the need to get off. The first part of the lesson was centered around how to conduct the ABC test. This test needs to be completed before each ride. We headed out for a ride so she could see me in action. She gave me in depth instruction on gear handling, along the way, which made a lot of sense and provided me with a visual to help me. Since the lesson I have been out on my own twice and there is a marked difference in my performance. My handling has improved. My speed has increased and my confidence in handling the terrain has skyrocketed. Nedra herself was very comforting and encouraging yet firm. She told me I had a mental block concerning riding in the street. I definitely agree, but I will say that I totally surprised that she had the gumption to say that to me. I think that alone sold me on her as a coach. 30 min Ride: After my ride yesterday I was eager to put everything I had learned into practice. I did well and I was proud of myself. I've gone from being concerned about not being able to competently ride to feeling like I do have a chance in this duathlon. Rest Day: Finally, I did the restorative yoga at the crack of dawn. I had been struggling with giving up an hour to do what basically seemed like laying on the floor, but I did it early before the toddler got up and felt amazing. Just as my session was ending and I was feeling mellow, the toddler woke up, "Mum, Mum, what you doing?" In her loudest street voice. 45 min Run / 15 min Ride: I was determined to do my best on the run and ride. Both went very well. Couldn't have asked for better. After my training was completed I hung out in the park with Zj and Aunt Gina. Address the emotional eating, again. Overall, it has been a great week and I feel myself gaining confidence and improving. If I look at the times and distances I'm definitely behind, however deep down on the inside I'm getting excited. I feel I can do it. So I'm going to ignore everything and do my absolute best. How do you handle emotional eating? I am happy to announce that Nedra Deadwyler of Civil Bikes will be sharing her cycling wisdom on MW in the coming future. Nedra, through Civil Bikes, is a full service cycling service - providing rentals, lessons, camps, tours, and historical tours to both individuals and groups. Click here for more info. It's great that you found a cycle coach to give you tips and set you off in the right direction. Sounds like you really got a lot out of it. One step at time and the rest will come. Hang with it! I really did Deborah. Thanks. I'm sorry to hear your runs haven't been going well, but glad cycling was better for you! As for emotional eating, I fall victim to that all the time. Being aware of it is the first step. Then I try to tell myself that it won't make me feel better and I'll actually feel so much better and proud if I don't reach for the bad food. Keep your head up - you can do it! You are so right Nicole. It really doesn't make me feel any better. Thanks Janell. Nedra is awesome. awesome!! i didnt know one needed a cycle coach. But now I see why. Your initial thought would have been mine also..lol. Glad it worked for you and that the effort was a victory. Keep at it!! Josselyne it seemed so ridiculous but I'm glad I did it. Glad to hear your second run of the week went better...those bad runs with pain can really play with your head. While I eat healthy 80% of the time, I do need to get my nutrition under control too- I just started a new program and am being more conscious of what I eat now too! Annmarie it really does mess with your mind omg. And timid about going out again. I never thought about getting a cycle coach. The only thing I was nervous about with my bike was the clip in shoes. I really have to think about unclipping when I'm stopping. I'm so afraid of falling over! Clips?! That would be the next level that I would not be looking forward to for that very same reason lol. Yes Maureen and I'm hoping to give some more attention to it very soon. Thanks! I admire you for tackling a duathlon. It's on my bucket list, but not there yet. While your diet (mine too) may be at times all over the place, the main thing is you're making healthier choices. Jamaican over McDonalds gets my vote. Keep it up! Trust me LaToya, I'm not there yet either. I'm just trying to make it work. I'm a bad emotional eater. As the stress levels go up, so do the cravings for comfort food in mass quantities. I've learned over time to try and deal with the stress first and then the food. I'm not always successful but it's definitely helped. Thanks Steph for the tips. My fear of riding with cars is the main reason I don't think I'll ever tackle a triathlon. Diet is definitely a challenge for me at times too. Yeah Ange, it is really scary. Sorry to hear that your runs haven't been going as well as you'd like, but yay for having an awesome cycling coach! I'm an emotional/social/everything-eater, so I'm not sure I can be of much help. Keeping myself well hydrated (or trying to) has been a good one for me though! I love that. 'An everything' eater lol. Hydration is an excellent tip. Sorry to hear about the bad run. I have been taking care of a sick little one and now I myself am sick and have missed almost 2 weeks of workouts and runs. My 5k is fast approaching so I gotta get to it! It is such a mental game! But you can do it!! I struggle with emotional eating as well, it's a work I progress. It's important to take it one day at a time. Your right. We can only tackle one day at a time. I hope you and your fam fill better soon. Best of luck on your race. I would love to meet with a cycle coach. I never know if I have enough pressure on my tires. Hey Margo appearently the pounds per pressure is found on the walls of your tires and you can get a pump with a gauge on it to determine the calculations. I too often fall victim to emotional eating. Its so hard to stop the cycle, but once you're able to, try your best to stay on track. Working it it now, again lol. Thanks! I would love to ride more often, but I am afraid of traffic. Hope this week goes better for you. I have been a Weight Watcher for eons and find the camaraderie and support of the group very helpful. They also have 24/7 online chat room support for members. Thanks Elle for the suggestion. I have never considered WW. Thanks Mckenzie! I really appreciate you. Jill, I have to admit I haven't been doing a great job at it. However I'll be on it this week. Thanks. Keep at girl, you fall down but you get back up. During the winter months I'm an emotional eater, happy eater, I'm just an eater. I just broke up with soda because I was hooked on Root Beer. As spring springs I'm looking to get out and running again. Mimi I am the undisputed Queen of getting back up lol! I'll be in DC in June. You will have to fill me in on Outdoor exercise fun. That food looks worth it! Investing in a coach or trainer can cause a tremendous increase in success. I'm glad that you're already experiencing growth in your skills! It was truly good! Lol! Thanks! Very cool that you have a cycling coach! I think if I ever want to get confident on a bike, I need to do that. I can't help you with food - my eating is all over the place with the marathon training I'm doing. Cycling coach changed my world! I'm going to try and tame the eating this week coming. Thank you for sharing your personal journey with us. Getting healthy is not easy but you are doing a great job! No it has not been easy but it has definitely been worth it. Thanks! I could definitely use some one on one time with a cycling coach. Hopefully the tips you get will be helpful! Making yourself accountable through sharing and setting goals can help with getting emotional eating under control. You are doing well and should feel proud! Feeling good Sandra. I've come a long way. Lol, used to have days of emotional eating. Much improved. A cycle coach will change your world. Try it. Thanks! Thanks Diatta. I think I'm going to do well too. Blessings! I am more of an emotional non-eater. When something gets on my head, I simply forget to eat and believe me, it is a dangerous as overeating. Try some kind of meditation or mindful practice. It will surely help you. Wow, that is s little scary. Everyone has something don't they. Thanks for sharing. I'm going to give more attention to it this week. Thanks! Look at you going strong! Big bravo for you. Yes, I'm a bit scared of riding outside too especially here in my city where traffic is pretty insane :D I am still an emotional eater so I'll be reading up all the comments here.